President Kersti Kaljulaid met in Kadriorg today with the President of the European Parliament, Antonio Tajani, along with representatives of political groups from the European Parliament to discuss preparations and priorities ahead of Estonia’s Presidency of the Council of the European Union. “I hope that Estonia’s Presidency of the European Union will be looked back on as the time when the ice began to thaw, and Europeans regained their confidence and acquired a more optimistic outlook towards a common future,” said President Kaljulaid. According to the Head of State, we are going through a testing period for the European Union and both the euro and refugee crises set a good example. “I do believe that the European Union, based on common values, will emerge stronger from these crises,” she stated. 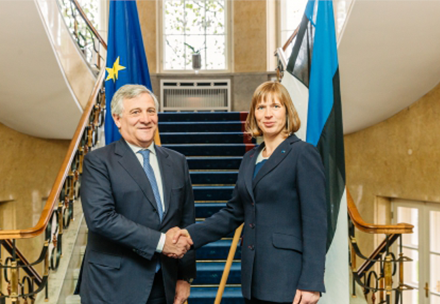 President of the European Parliament, Antonio Tajani, wished Estonia success during its presidency and expressed the full support of the European Parliament.